Intermission is one of those maddening apps where you wonder how you lived without it for so long, but shake your fist in frustration due to some of its limitations or quirks. Since it gives you the ability to pause the sound of whatever you're listening to online, you can easily return and pick up where you left off. You can also skip ahead past commercials of recorded radio stations, which is highly convenient. 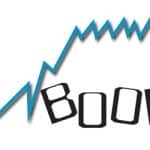 I like listening to talk radio and it seems 60% of the airtime is dedicated to commercials. I simply start my stream and hit the pause button in Intermission. In about 15 minutes, I can come back and start listening and be able to bypass any commercials I encounter. If you want to replay something you just heard, you can do that easily as well. 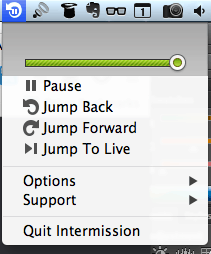 As indicated in the above screenshot, Intermission resides in the system menu bar and has four controls: Pause, Jump Back, Jump Forward, and Jump to Live. 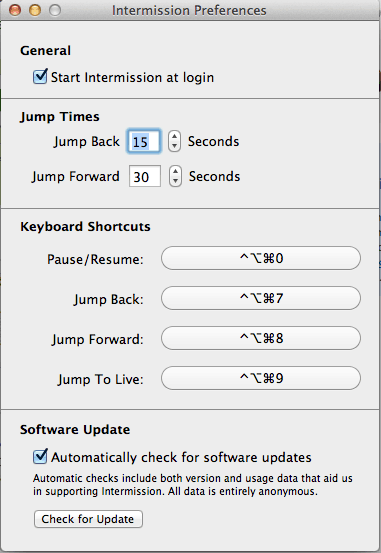 You can configure the time increments you can jump forward or back in the app's preferences. 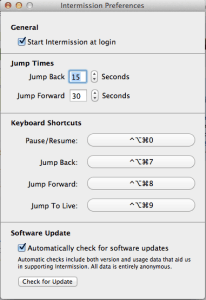 As you can see in my preferences, I have it configured to jump back 15 seconds and jump ahead 30 seconds. You can also assign keyboard shortcuts for the app, allowing you to control interactions with the app via your keyboard and making it really easy to pause, rewind, and skip ahead. While Intermission provides a great system for pausing up to three hours of live audio, it does have some drawbacks that you need to be aware of. First, it controls all streaming audio. Let's say you've paused a stream on iHeart.com and want to watch a YouTube video online. Well, you won't be able to hear the video's audio until you've un-paused and have “Jumped to Live” in Intermission. You also have no control over what app, browser window, etc. it's recording as it records everything it hears. For instance, if I want to listen to Spotify, while “pausing” a talk show on iHeart Radio, I can't do that either. In addition, if I'm playing a game that resides on my system and want to pause audio from a streaming source, it will pause the game's audio as well. According to Rogue Amoeba, system sound effects will still pass through without being recorded as long as you're running OSX 10.8+. If it's possible, it would be really nice for the developers to allow you to specify what browser window(s') / program(s') audio can be paused during a given session and/or be given the option of excluding apps from Intermission altogether. If you're committed to listening to live streaming audio and don't multitask with other sound generating applications or activities, Intermission is a great app for controlling that audio. 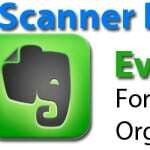 But if you're going to be using a variety of apps, or watching videos, etc. unfortunately, you're stuck with an all or nothing scenario. I think Rogue Amoeba is on the right track with the app and with some additional configurability options, it will be an awesome app to have. At the time of this writing, it's available for $15 directly from the Rogue Amoeba website which is worth the price if you're in a need of a way to pause live audio.